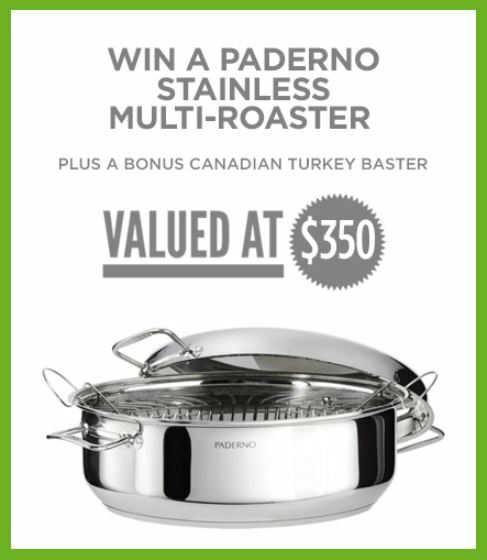 Enter the new Canadian Turkey Contest, in it, you get the chance to Win a Paderno Multi-Roaster valued at $350. To enter you simply have to visit the official contest web site located at the following link, then fill out the entry form with you email address and province, check the box to confirm your residency and submit it. Entries to this competition close on April 19, 2019 at noon ET. Winner will be selected by random draw from all eligible entries received during the contest period. The winner will get a Paderno Stainless multi-roaster valued at $350. The Canadian Turkey Contest begins on April 15, 2019 and ends on April 19, 2019.